In 2013 I had an exhibition of paintings called 'Provisional Cities'. Most of the work consisted of paintings in the format of 6x4 inch postcards. This had evolved from work made specifically for the annual RCA Secret postcard sale: I had liked the idea of working within the prescribed format. As a series of paintings, to begin with the subject matter was not so prescribed, but became more so as the work continued. Like the postcard itself, many of these paintings were of ‘views’, although not necessarily those souvenirs or aide-mémoires that might typically feature as postcards. In my work there was the germ of an idea for a topographic project in which I was able to make comparisons and draw parallels between different aspects of the built environment, in different areas, different cities, different countries. Although not clearly thought through as a programme of work, which evolved as I made the paintings, certain features began to bear repetition: light to medium industrial uses of suburban areas, port facilities, the architecture of underground railways or rapid transit systems. As I made the paintings from my own photographs, I realised that other images could fit within the types that I was using. With some of the compositions being inspired, if loosely, by stills from films, I found a handful of stills which would not be anomalous within the set of work. 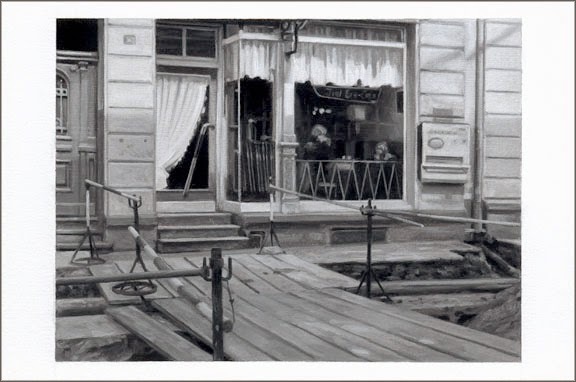 The exhibition Provisional Cities was promoted on posters and online with one such painting, 'Cafe Restaurant with Roadworks’. This was based on a still from Wim Wenders’ film, Alice In The Cities. It is 45 minutes into Alice in the Cities before Alice and Philip return to Europe without Alice’s mother. A shot of a plane, their plane, silhouetted against the sun, logically rising as they are going east, suggests a break in middle of the film, separating its American and European halves. This brief shot fades to black. 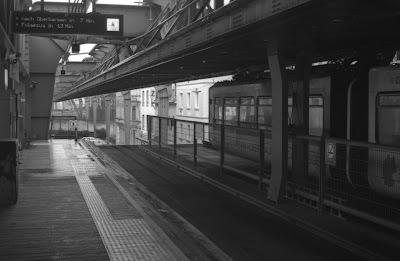 The next shot is a fade in, to a plane landing in Amsterdam (Wenders uses lots of fades to black in the film generally; with the episodic structure of the film, these fades create a sense of elision, that time in the film passes between episodes, as opposed to cuts, although how much time is missing is often unclear). "about a man who's supposed to be writing a feature about America. He can't do it, and the film begins with his decision to return to Europe. He happens to meet a little girl, Alice, and her mother, and promises to take her back to her grandmother in Europe. Only he doesn't know where she lives; all he has is a photograph of the house. The remainder of the film is taken up by the search for the house." There are few scenes at a hotel near the airport while Alice and Philip wait for the arrival of Alice’s mother. The screens over the hotel room’s window show a picture of a landscape of windmills, a replacement of the ’anywhere' of the hotel (anonymous, international modernism with no sense of the vernacular) with permanently spring or summer 'any time’: sliding the screen over the window reminds the room’s occupants that they are in the low countries. Returning to the airport in vain, with Alice, upset, locked inside a toilet cubicle, Philip reads through a list of German town names from a book. At the end of the alphabet, the name ‘Wuppertal’ provokes Alice's memory of her grandmother's house. Keiller’s discussion of the phantom ride is in relation to early non-narrative cinema and its role in fracturing the familiar spaces that existed before the imaging (and other) technologies of modernity and their abilities to collapse time and space: “For Henri Lefebvre, ‘around 1910 a certain space was shattered’ so that early cinema, arguably, offers a glimpse of this space just before (or possibly during) the period in which its ‘shattering’ occurred.” Had Wenders’ filmed from the front of the Schwebebahn, this brief sequence would have had a very different effect: although it only lasts for a few seconds, the viewpoint is disorientating, decentring and unexpected. The phantom ride had to be reversed to achieve this, which has the added effect of starting from darkness - like cinema itself - then establishing where the viewer is situated with the camera retreating inside the carriage. There is a sense of time passing in the lighting outside (it is getting dark) from the brief few shots that comprise this sequence, but with very few clues as to how long they have been on the monorail. 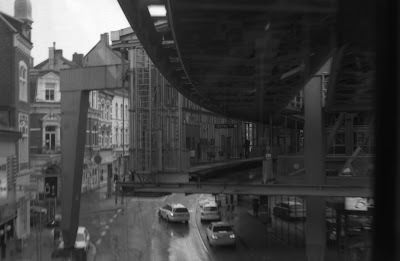 Further to his use of fades to black, employing cuts within a particular mis-en-scene, Wim Wenders often leaves the viewer with an impression that time may have elapsed between camera angles, an effect that works especially well in Alice in The Cities, suggestive of the elasticities of time when travelling: jet lag and changing time zones, sleeping and waking at odd hours, the soporific rhythms of mechanised transport. Philip and Alice alight at a station in twilight. Among the notices and advertisements which railway stations feature as their wallpaper, the end of a name can just be read: “-NBORN”. 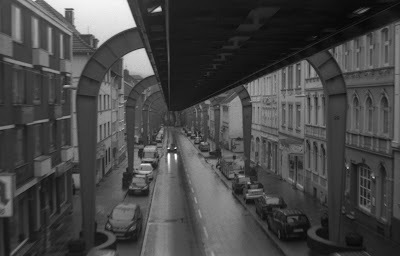 Although not exactly matching any current station name, it is clearly Sonnborner Strasse, as the exterior shots show the same location as the station itself, and I imagine Wenders owes his location this amount of fidelity. 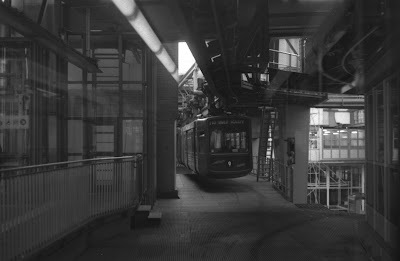 The Schwebebahn features directly outside the window of Alice and Philip’s hotel room, on the same street, as Philip invents a bedtime story. "From the composition of the sequence, it is clear that the bird flies into the frame quite by chance: the camera had previously been tracking along a different line but, once the bird enters the frame, the camera follows its path. This signals a desire in Wenders for the camera to enjoy the same openness of vision and attention that Alice - the first of a number of children who, in Wenders' films, are blessed with clear vision - shows for the incidental. Objects on the edge of the diegesis - here, the bird - are often allowed to drift into the frame, even though they may have little or no relevance for the development of the plot, as is the case here." Children, from Alice, through those that feature in Paris, Texas, Wings of Desire and Lisbon Story, extend into the space of the cinema of "pure contemplation": although acting, with lesser or greater degrees of awareness and self-consciousness, one gets the sense that, like the bird coming into the shot of the telescope, like the early 'pure cinema' of the phantom ride, for Wenders, the children are in some sense, more being truly themselves, existing in front of the camera. Twenty years after Alice In The Cities, Rudiger Vogler would appear again as Philip Winter, in Wenders' Lisbon Story. 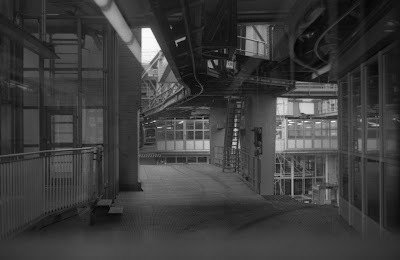 In the final sequences of the film, Philip convinces Friedrich Munro to complete his abandoned portrait of the city. The viewer has already seen some of Friedrich's film-within-a-film, through Philip's viewing of the silent footage prior to Philip's forays into the city to capture the sound to accompany the images. Reunited with Friedrich, who has been an absent, disillusioned character for most of Lisbon Story, the two are seen, slapstick-fashion, filming with Friedrich's old hand-cranked silent movie camera, notably around, and then on a tram - creating a new phantom ride.